Marestail (Conyza canadensis, family Asteraceae), which is also known as "Canadian horseweed," or just "horseweed," has moved from field crops to become a plague in landscapes and nurseries. The main reason is that certain biotypes are resistant to glyphosate (e.g. Roundup) as well as a number of other agricultural herbicides. 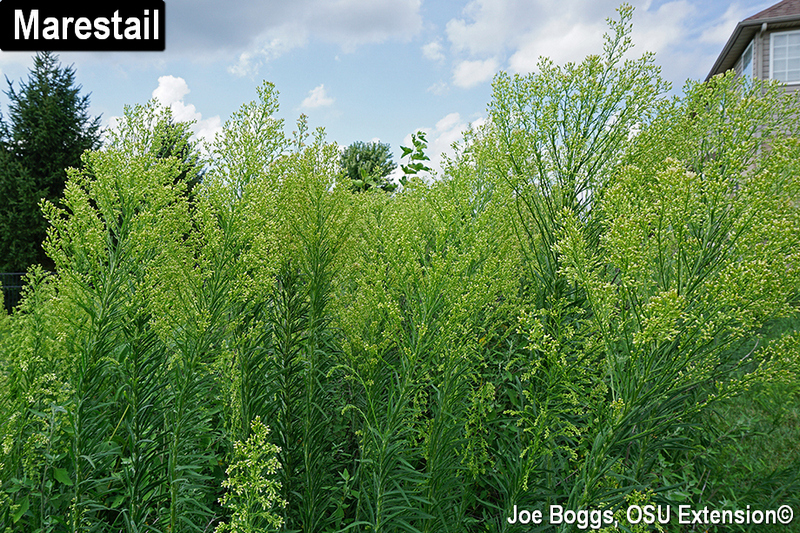 In fact, this native North America plant has become such a problem in Ohio it has been added to the state's noxious weeds list. Marestail presents three management challenges. First, the weed can flourish under a wide range of growing conditions. It will endure both drought as well as water-logged soils such as in drainage ditches. Plants will produce viable seeds in poor, low nutrient soils as well as highly fertile soils. Growth appears unaffected by soil pH with plants thriving in both alkaline and acidic soils. The second challenge is this annual weed's opportunistic life-cycle with the ability to behave both as a summer and winter annual. Seeds may germinate in late-summer to early fall (winter annual cycle) or in the spring (summer annual cycle). Once seeds germinate, the plant forms a ground-hugging rosette that can be easily mistaken for other weeds. As a winter annual, marestail remains in the rosette stage through the winter, and then it bolts in the spring. As a summer annual, the weed remains in the rosette stage for only a very short time, and then it bolts in early to mid-summer. Thus, seed production is asynchronous with seed heads appearing at different times of the year. Once marestail bolts, it quickly forms a single, unbranched hairy stem that is densely covered in alternating oblanceolate leaves measuring 3 - 4 inches in length. Leaves near the base of the stem are longer and somewhat toothed compared to leaves near the top of the stem. As flowers are produced, old leaves on the lower stem wilt and turn brown. Numerous small flowers are borne on multi-stemmed, broom-like panicles at the top of the stems. The common names are based on the resemblance of the flower structures to equine tails. Marestail is a prolific seed producer and membership in the Asteraceae family is clearly demonstrated by the tiny, puff-ball-like seed heads which resemble miniature dandelion seed heads. Seeds can be wafted considerable distances by the wind. Marestail can be effectively managed culturally with the key to success being early identification and persistence. Tilling new beds or new landscape installations in the spring that are infested with marestail will destroy young plants in the rosette stage. This will help to prevent future battles with this weed. Mulch will help suppress seed germination. If seed does germinate, maintaining a 2 – 3" mulch layer makes hand-pulling more effective because plants will partially root in the loose mulch rather than entirely in the soil. Trying to hand-pull young plants anchored in dry or compacted soil often results in the single stem breaking off. Decapitated young plants behave like the Greek Hydra by producing multiple stems each with their own seed head. Continual mowing or string trimming prevents seed head development and will eventually exhaust the resources of this annual plant. Although herbicide resistance is a major issue, a number of pre- and post-emergent herbicides remain effective. Pre-emergent herbicides include flumioxazin (e.g. SureGuard, BroadStar); oryzalin (e.g. Surflan); and isoxaben (e.g. Gallery). Effective post-emergent herbicides include carfentrazone-ethyl (e.g. QuickSilver) if mixed with a phenoxy-type post-emergent herbicide such as 2,4-D. 2,4-D is effective if mixed with dicamba, MCPP, or MCPA. As with any pesticide application, you must read and follow label directions. Pay close attention to recommended distances to desired plants including warnings about plant root zones. Of course, no marestail management strategy should depend entirely on herbicides. That's how we got into trouble with this weed in the first place!